A big thank you to the CFA and the fire bomber "Elvis". I was watchful but not particularly concerned yesterday, 4 km downwind from the Upwey bushfires, under the smoke plume, the light had turned that orange colour. 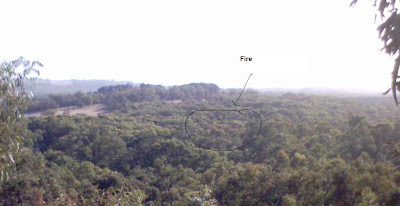 Then there was a second column of smoke and much closer, 200 metres from the house. Was it a spot fire? There had been no sign of embers or ash falling from the sky. Then "Elvis" the big helicopter arrived dumping 10 tonnes of water at a time. It dumped 5 or so loads, passing directly over the house at treetop height till the fire was out, or at least manageable by ground crews. There is the facility to insert a block of Python code into TurtleArt in its current experimental fork, TurtleArtPortfolio on the OLPC. (This feature is now in Turtle Art from V44) Thanks Walter for the following help. As of TurtleArtPortfolio V17 , when TA is first run, it creates a copy of tamyblock.py in the journal. The Python code can be loaded into TA using the Save/Load menu tab. Currently having problems with Rainbow security settings, follow this link to Rainbow for how to disable it. For TurtleArt in its current experimental fork, TurtleArtPortfolio on the OLPC. Use the a s d keys to fire the thrusters. Keys do not auto-repeat. Execution speed is becoming an issue, each block adds 2-5 mS, the print adds 25mS, the wait 1, which is necessary to see the turtle, adds 10mS. The area of the canvas limits how big a program you can create, is it worth adding scroll bars? Dragging the stack of blocks is starting to become slow. It is not possible to test if a key is held down. 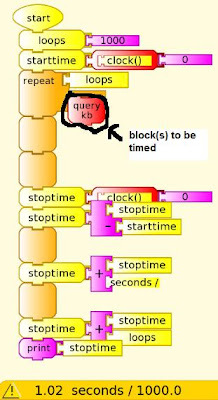 I used the following TA program to time the execution time of each block. It uses the clock() Python function from the time library. TurtleArt in its current experimental fork, TurtleArtPortfolio , allows students to use Python functions in a special block. The intention of this feature is to provide a "higher ceiling" for open ended learning. 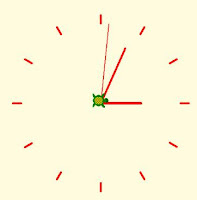 I decided to try this function to do an analogue clock , a task that I had previously done in Gamemaker. It turned out to be a trivial exercise for some learning goals because trigonometric functions of sin() cos() and pi() were not required, I could just use set heading. 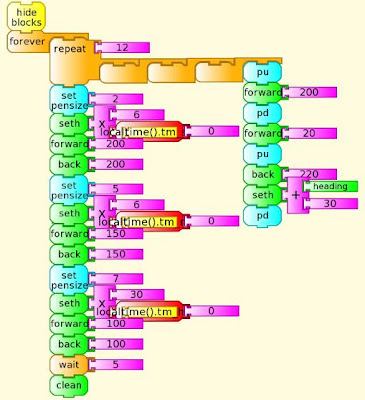 The programmming in TA visual blocks is shown in the picture below. for the minute and hour use tm_min and tm_hour respectively. The time function that I required was not already imported into TurtleArt. Can you use the insert function block to import a library? Apparently not because import does not return a value. Could the block be reprogrammed so that it does not need to return a value? 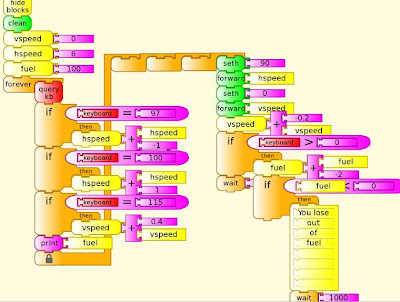 If all likely imports are already programmed in, does TurtleArt become clumsy, slow to load and a memory hog? If students can't access all functions they don't have a sufficiently high ceiling. It either needs better documentation, more code examples or both. The block has insufficient space to type in long expressions, you can't edit an expression, you have to retype it, when dragging a block containing a long expression, it leaves bits of text on the canvas.